We tech freak are not so much in touch with nature as everything we use seems to be made out of plastic. But how about a new mouse that is made out of wood? This wireless mouse will bring back a piece of nature to your desk. Now you can have the feel of wood while working with technology. This is a wireless USB mouse that works on the 2.4ghz frequency and even has a build in rechargeable battery. Why still go with a plastic mouse when you can go with wood. And this wooden mouse cost less then 20 dollars so even in price it can compete with plastic. 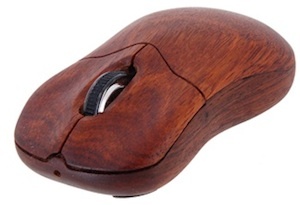 Get back the feeling of nature with this Wooden Optical Wireless Mouse.